One thing that I have been trying to do more of in my life is step out of my comfort zone, whether that be trying new clothing pieces, food, or even in my yoga practice. 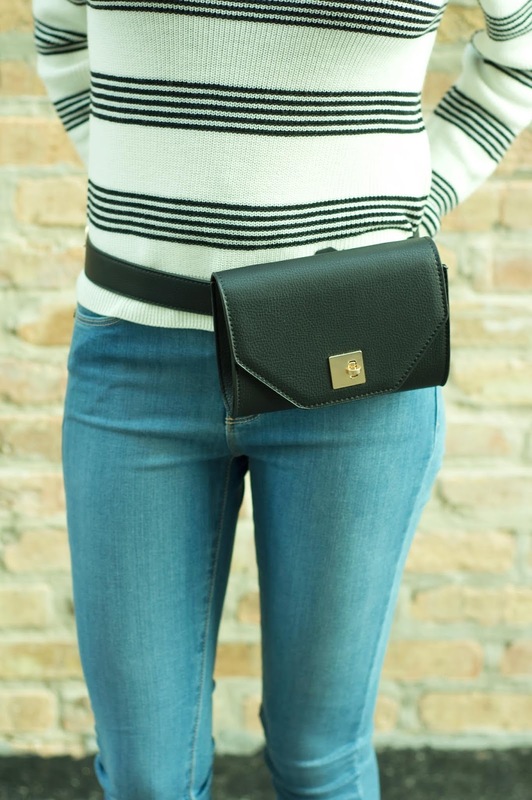 I was never a fan of the fanny pack trend (yes, I know, I am a child of the 90s, how dare I), but I was willing to give it a try when I saw this adorable (and versatile) version from Enzee Boutique. One thing that really drew me to this bag is the fact that you can wear it around your waist OR you can adjust the strap and wear it around your shoulder/cross body. I am a fan of multi-functional pieces, which brings me to the next reason why I love this bag- it’s black! Yes, you always hear people say, black goes with everything, but it really does. You can never say no to a black bag because it truly will match just about every outfit. This little bag is perfect for those days you don’t have a lot to carry around or if you need to work on cutting down the number of items in your purse (guilty as charged). I invite you to step out of your comfort zone and try something new- even if it’s just switching up an outfit!